Recent studies are making many researchers re-evaluate long-standing ideas on the development of chronic obstructive pulmonary disease. An ATS mythbusters symposium on Wednesday will examine the emerging theory that the alteration of lung tissue regeneration, not inflammation, plays a driving role in the pathogenesis of COPD. Presenters will explain how aberrant airway and alveolar regeneration contribute to the pathogenesis of airway remodeling, emphysema, and inflammation in COPD, and how this could be translated into personalized approaches to prevent, diagnose, and treat the disease. “The goal of this symposium is to facilitate a better understanding of COPD as a complex disease by discussing cutting-edge discoveries in the field. We hope to stimulate innovative ideas based on these discoveries, which could lead to novel approaches to prevent and treat this incurable disease,” says Renat Shaykhiev, MD, PhD. Dr. Shaykhiev is one of the moderators of “ATS Mythbusters: Aberrant Tissue Regeneration Is a Primary Driver of COPD Pathogenesis,” which will be presented from 9 to 11 a.m. in the Moscone Center, Room 2016/2018 (West Building, Level 2). 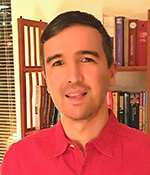 “A long-standing dogma in the field of COPD research has been that lung tissue derangement in this disease develops as a result of an exaggerated inflammatory response of lung cells to cigarette smoke or other environmental stressors,” says Dr. Shaykhiev, assistant professor of medicine at Weill Cornell Medical College, New York, New York. However, anti-inflammatory therapies have not been fully effective in treating patients with COPD. This suggests that other mechanisms may be the driving force of COPD pathogenesis, he says. The results of recent studies link several aspects of lung tissue regeneration to the development of COPD, with endogenous stem cells playing a key role in this process and inflammation taking a secondary role. This scientific symposium continues a series of mythbuster sessions presented at previous ATS conferences. It features five presentations and a discussion with renowned researchers. A related session on the disease is “COPD Exacerbations: Biology and Targets for Novel Treatments,” presented from 1:30 to 3:30 p.m. Wednesday in the Moscone Center, Room 134 (North Building, Lower Level). Six presentations will explain that inflammation is not the only mechanism for COPD exacerbations, the roles of cells and mechanisms in COPD exacerbations, and the role of novel treatments. “COPD Exacerbations: Biology and Targets for Novel Treatments” (D83) is supported by educational grants from AstraZeneca LP and GlaxoSmithKline.